New recipe! Zucchini Bread, grain free with peanut butter and chocolate chips! 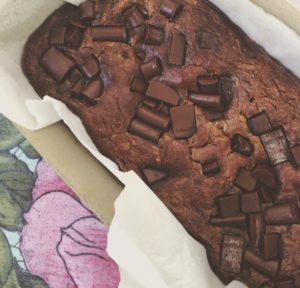 Zucchini bread, grain free with peanut butter & chocolate chips! Preheat oven to 350 degrees F. Line an 8X4 inch loaf pan with parchment paper, grease with coconut oil. In a large bowl, mix shredded zucchini, peanut butter, maple syrup, eggs and vanilla with whisk until well combined and creamy. Stir in coconut flour, baking soda, cinnamon & salt. Fold in chocolate chips, reserving about a tablespoon for sprinkling on top. Pour batter into prepared pan, sprinkle remaining chocolate chips on top. Bake for 40-50 minutes or until a toothpick comes out clean. Remove from oven and transfer pan to a wire rack to cool for 15 minutes, and then remove bread from pan and transfer to wire rack to cool completely. Slice and enjoy!